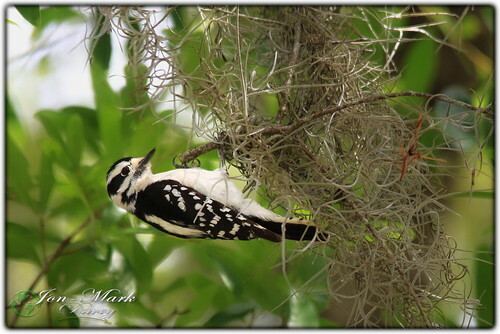 One of the neatest little Woodpeckers is the Downy Woodpecker. It is small and, even though monochromatic, beautiful. I found this little lady capturing bugs just above my head as I stopped to look for Owls in one section of 3 Lakes WMA in Central Florida along the Kissimmee Prairie. She allowed me time to capture several shots as she walked through the light rays in the tree. When you visit about any place in Florida it pays to set up a shooting location and posture, remain motionless and quiet and wait for wildlife to find you. Still and quiet is extremely important when looking for wildlife to photograph. Another reminder, when in the wilds of Florida, to ALWAYS be aware of your surroundings, meaning, watch for snakes. Just down the dirt road from the place I captured this shot we had an exciting encounter with a six foot Rattle Snake and when we shoot in Holy and a couple other WMAs in the south regions we have to be watchful of running into a Python, we know they exist where we tramp around photographing birds. Plus they just released a Florida Panther in one of the WMAs where we regularly explore so it’s a good idea to explore in pairs so one can watch your feet as you stand there looking into the trees. Snake boots are probably a good buy for these expeditions too. 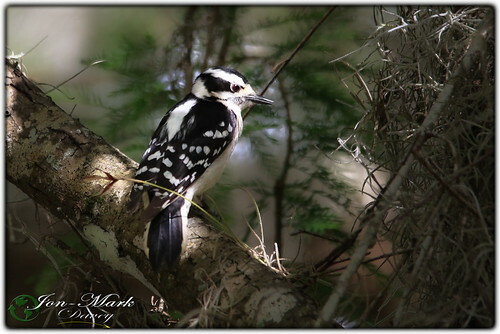 This little guy looks very much like a downy woodpecker and is often misidentified. He is actually a tiny bit larger, with a MUCH longer and heavier beak. He is not nearly as commonly seen as the downy. If it isn’t a Downy, what is it? It is a nice bird.